ClarinetFest® is the largest annual gathering of clarinetists of all skill levels, making it the ideal place to be immersed in the clarinet world. You will hear world-renowned performers, try the latest clarinet technology and learn skills to improve your playing from master clarinet teachers. Check out the schedule online ahead of time and organize your day using the conference book to plan which performances and lectures you want to catch. Remember to include breaks so you can process what you are seeing and hearing. Go with goals for trying or purchasing any instruments and equipment so you don’t get overwhelmed in the vendor hall. Go hear the final rounds of the annual ICA competitions and be inspired to compete next year. Entering competitions improves your musicianship as you strive to your highest level of playing and increases your exposure to the clarinet community. Go to the ICA General Business Meeting during the conference. It is open to all members, you will meet key people within the organization, and everyone can vote on items affecting the future of ICA. The clarinet community is a small world of interwoven relationships, and opportunities frequently arise from having connections with other musicians. Therefore, it is essential to get to know other musicians in order to expand your possibilities for collaboration and performance. Follow up with artists you meet at ClarinetFest® or at concerts generally (get their business cards, look at their websites, check out their social media). Reach out to local music organizations about joining summer concert bands or holiday gigs, which can become recurring. Befriend and learn from a large circle of musicians. Think outside the clarinet section! Create business cards with your name, contact information, and a link to your online presence so that people can listen to your work. Playing in a chamber group teaches valuable lessons in musical teamwork. It provides an enjoyable atmosphere for artistic growth and constructive criticism in a smaller setting than a band or orchestra but larger than simply playing on your own. Approach friends and colleagues about performing music together. Don’t let unusual instrumentation limit your repertoire options. You can compose your own works, arrange public domain music, or look for open score pieces. Consider performing contemporary compositions through collaboration with emerging composers. Creating a recording of the work is also mutually beneficial for you and the composer. Even if you don’t perform publicly, playing with others builds musicianship skills that you can carry over to other ensemble playing. If you are not in an established community or school ensemble, your performance opportunities might seem limited. Perhaps you’re looking to perform in a unique genre or style. Creating your own gigs allows you the artistic freedom to perform whenever and however you imagine! Consider performing at open mic nights, community events or gatherings that may allow for background music. The starting point for finding a venue or inventing a gig for yourself or your ensemble is to send out lots of feelers: write emails, make phone calls, or go in person to talk to places you think would benefit from your musical services. Think about your ensemble and repertoire and what scene you might fit into, but also don’t be afraid to ask or apply to unconventional locations. The worst they can say is no. Look for annual events and offer your musical services to the directors. If they like your playing, you may be invited again next year. Politely seek, but don’t necessarily expect, payment at first; community organizations don’t often have a budget but will welcome your music. Instead, center your objectives on gaining exposure, performance experience, and establishing yourself. Payment may follow if the gig becomes a recurring event. Produce your own events and collaborate with other chamber groups. Create a concept you are passionate about and run with it because audiences will be drawn to unique ideas. Have a publicity and marketing plan, as the venue may not do this for you. Attending local arts events can give you ideas and inspiration for your own musical projects. Showing your support for and engaging with other artists will increase your visibility as an active musician in your community. Explore local concerts and arts events: this can present potential gig locations for your own ensemble and you will enjoy hearing the live music. Volunteer to help during festivals, community events, or with your local symphony – supporting community arts events secures a thriving arts community and ensures opportunities for you in the future! 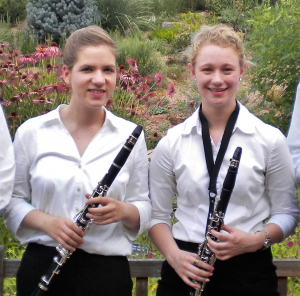 Allison Allum (right) and Emily Kerski (left) have been collaborating since 2012, where they met in the Colorado State University Clarinet Studio under Dr. Wesley Ferreira. As co-founding members of two chamber ensembles, they appeared as guest artists at ClarinetFest with Quartet Atrevido, organized a summer concert series in Fort Collins, Colorado, and produced CURIOUSER, a contemporary music event featuring numerous world premieres. They are avid proponents of musician entrepreneurship and envision a thriving arts community for all.